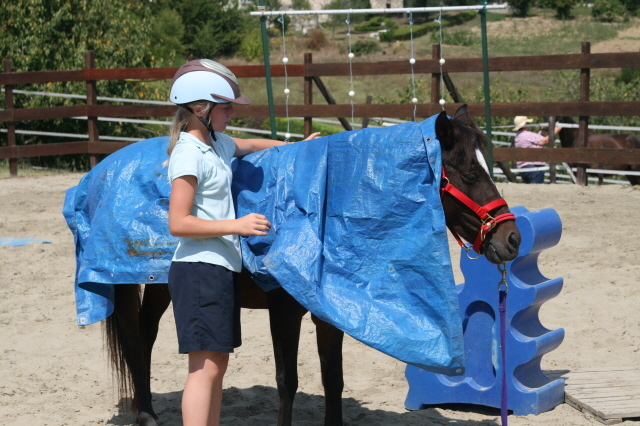 Find out what's been happening at Bond With Your Horse over the years. 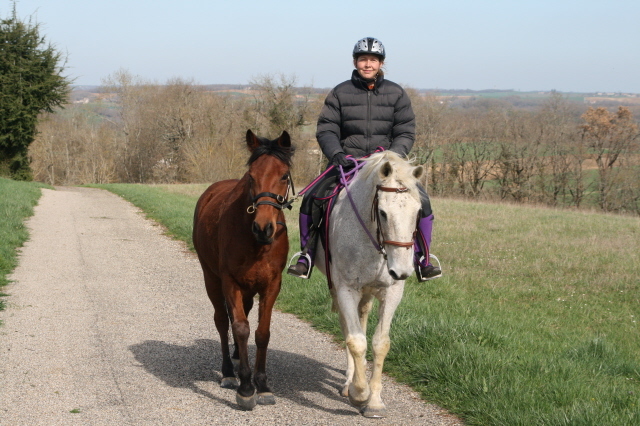 2016 has started well with Zamil completing easily at 60kms at our final competition in France before the big move. 2015 was a very mixed year. 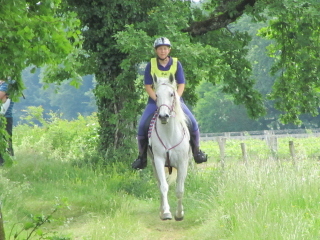 Roma completed 120kms CEI** at Fontainebleau and made it look easy with incredible recovery times. 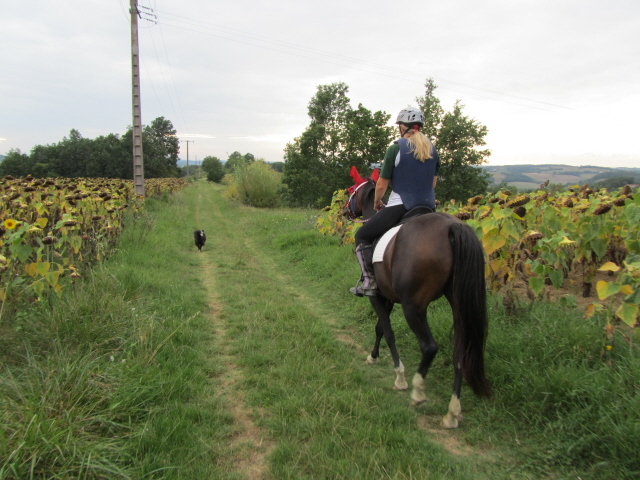 But she then didn't qualify at Castelsagrat 120km or Monpazier 2 day x 70kms due to lameness at the end, once getting cramp (which was gone 30 minutes later) and once pulling a shoe on the last loop. Zamil managed to fall at 2 competitions (due to getting so excited about being in a 90km race ride that he stopped looking where he was going) and so the whole rest of the season was a write off. 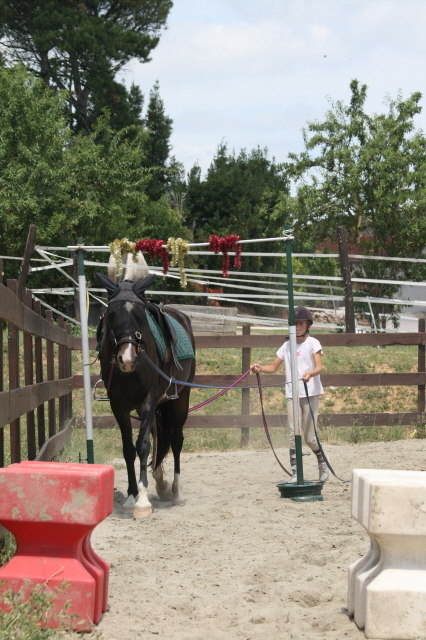 We have been on a mission ever since to get him less stressed in a competition environment. 2014 was a very succesful year. The highlights were that both Roma and Zamil qualified at CEI* at Castelsagrat and Roma won the 90km race ride at La Plaine at 18kph and came 3rd in a sprint finish at the 90km race at Mainzac. Both had excellent heart rates at all their comps so hopefully it's a good sign for the future. Sana, now being retired from International endurance, has been enjoying a varied year, including going on a J-F Pignon course. 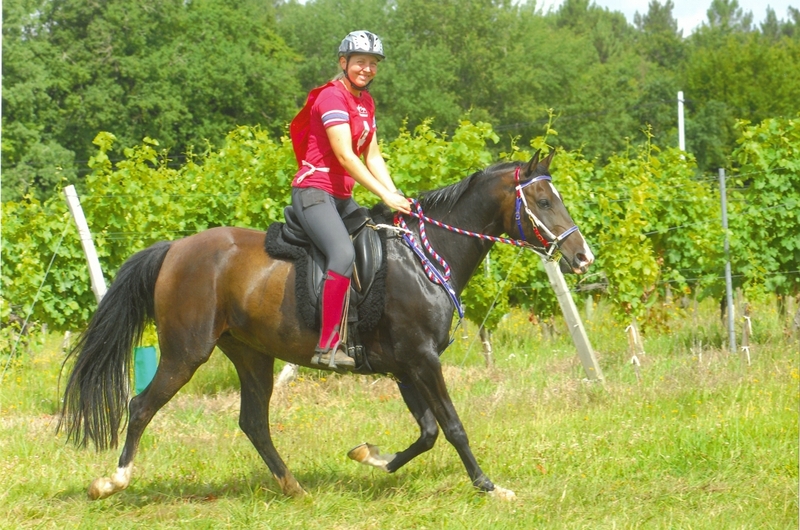 Nikaya de Paute, who Jo trained in 2009, qualifed at The Endurance World Championships at Euston Park. Qualifying Kalinka at 40km, 60km and two 90kms including a 1st place in the 90km at Masquieres in June and then getting her first International Qualication at the CEI * 90km at Monpazier. 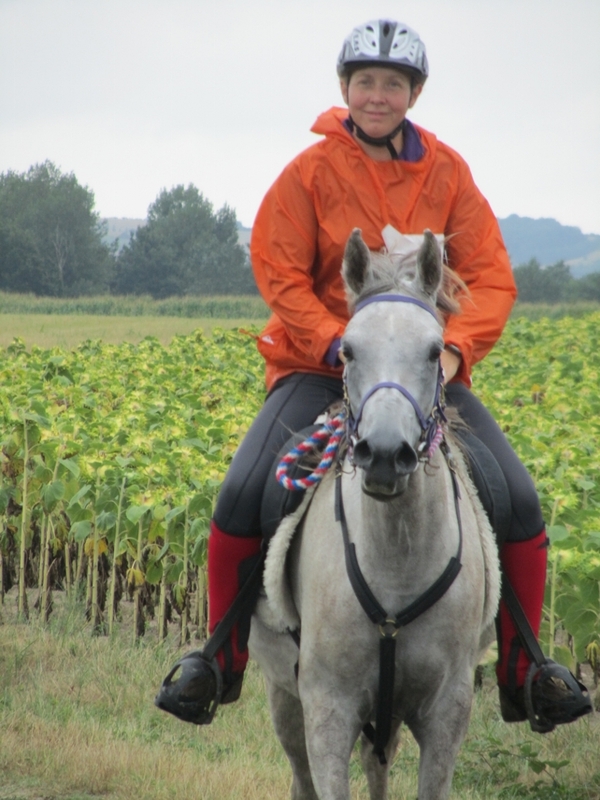 Kalinka is now continuing her career with Belgium team rider Wendy Fallon, who qualified her in November at CEI** 130km at Pontchateau. Nikaya de Paute, who Jo trained in 2009, finished 23rd at the European Championships at Florac. Here is a link to a video of the Final Challenge at the end of the August course. 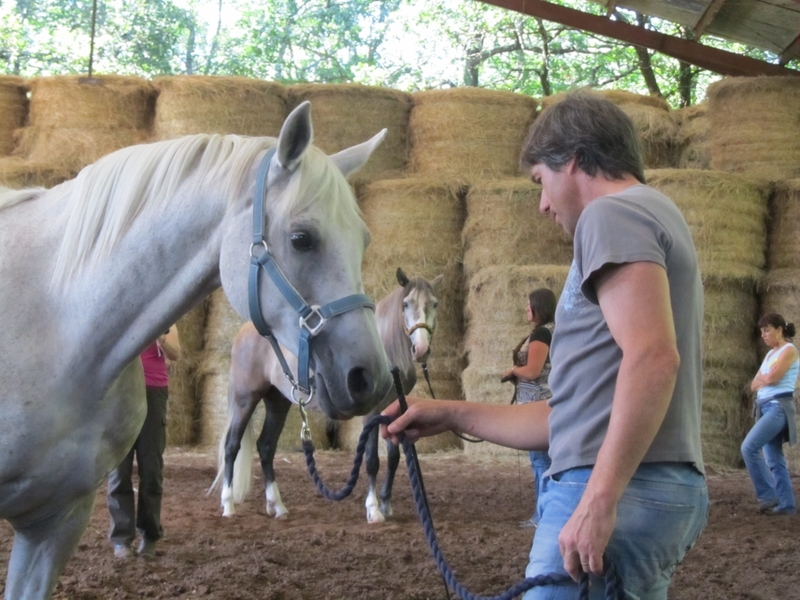 Feedback from Kitty Abse, one of the students on the August course: "I spent three fantastic days at Jo's yard, learning how to put into practice all the things I had read about in Monty Roberts' and Kelly Marks' books but which somehow seemed much harder in practice and which had left me frustrated and lacking in confidence working with my young horse at home. 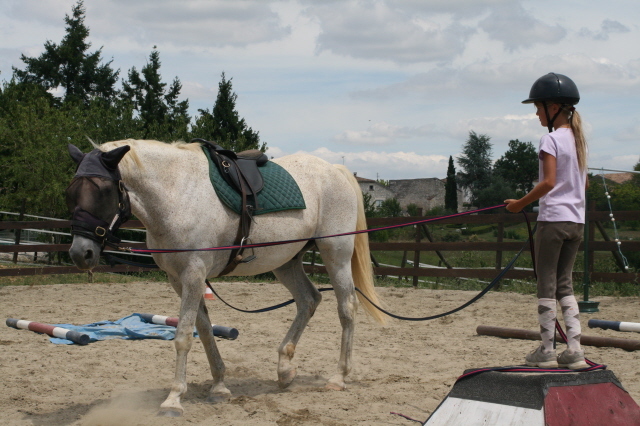 Within 10 minutes of starting to work with my horse after the course, all the things I had read and now learned were happening and after 15 minutes I had a calm, happy horse working to lead nicely and backing up and coming forward just by following my body language, with no lead rope. It was amazing. 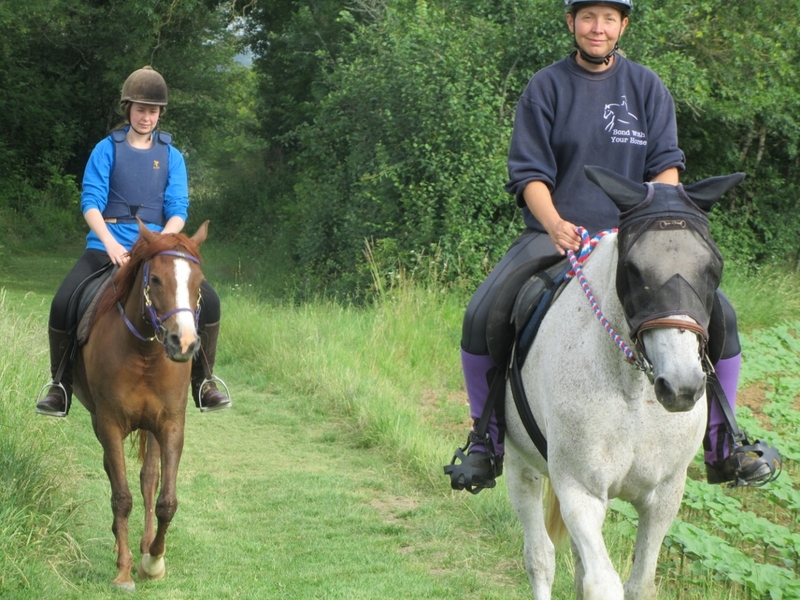 I can't recommend Jo enough as a trainer, she gives you confidence and trusts you to work with her beautiful horses, which makes you really believe you can do it. I can't wait to do another course with Jo." 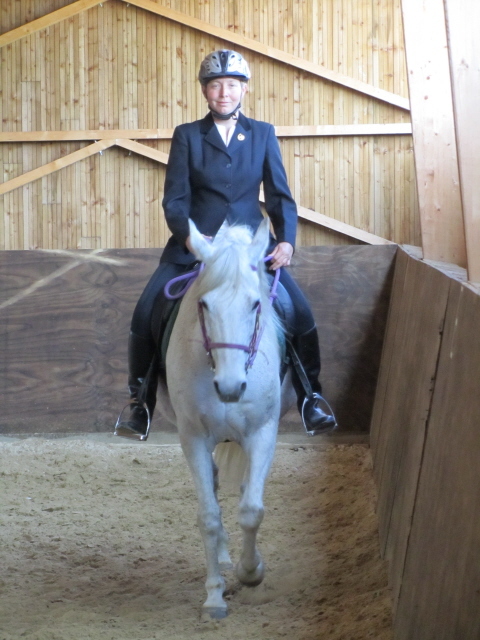 Feedback from Claudine Wakeman-Reynolds "The course was great, I've already started using some of my new found Dually skills on Hermes! 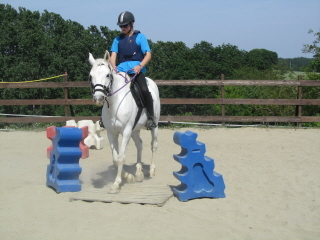 Hermes was started by Jo and I undertook the course to make sure I could give him the best start, he had a clean slate and I want to keep it that way." 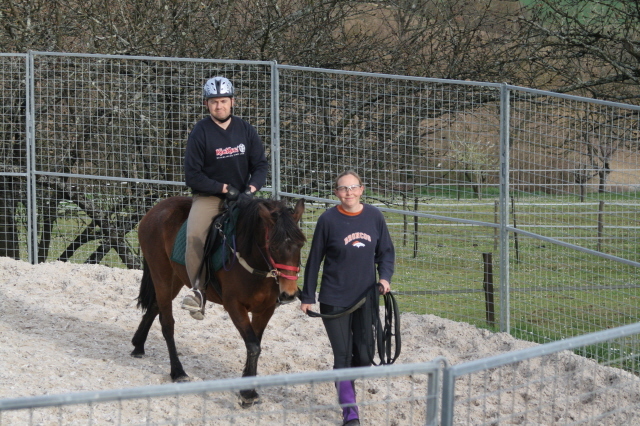 Melissa obtaining her Monty Roberts Introductory Certificate, with help from her project starter Bess. Here is a link to a whole series of videos of the process of starting Serenity. Competing in her first 20km comp after being started and then fittened. She finished with a heart rate of 40bpm. 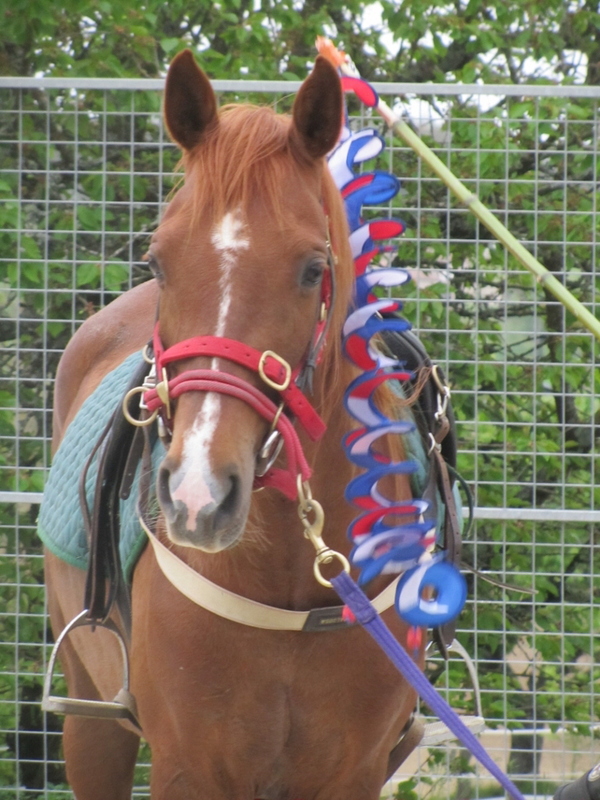 Romance carried on with her owner to qualify at the 5 year old Young Horse Endurance Final at Uzes, obtaining a 'Très Bon' classification. 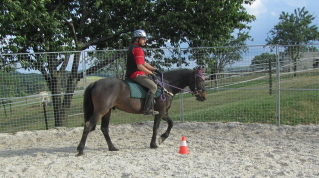 A very tricky starter, being de-sensitised to the movements of the dummy rider. So far she has been Jo's most complicated starter (we believe that someone had previously tried to start her and really frightened her). But with a lot of patience she is now happily hacking out. One of the sweetest horses I've ever met! First time with tarp and plastic! Jo's own youngster, who has now gone to spend the rest of the year growing-up (physically and mentally) in a herd in the Pyrenees before starting work in 2012. Saxo and Ocean came together. I started Ocean 3 years ago but his owner has not had the time until now to ride him so he came in for re-starting and schooling. Saxo who has lived with Ocean all his life came in for starting. 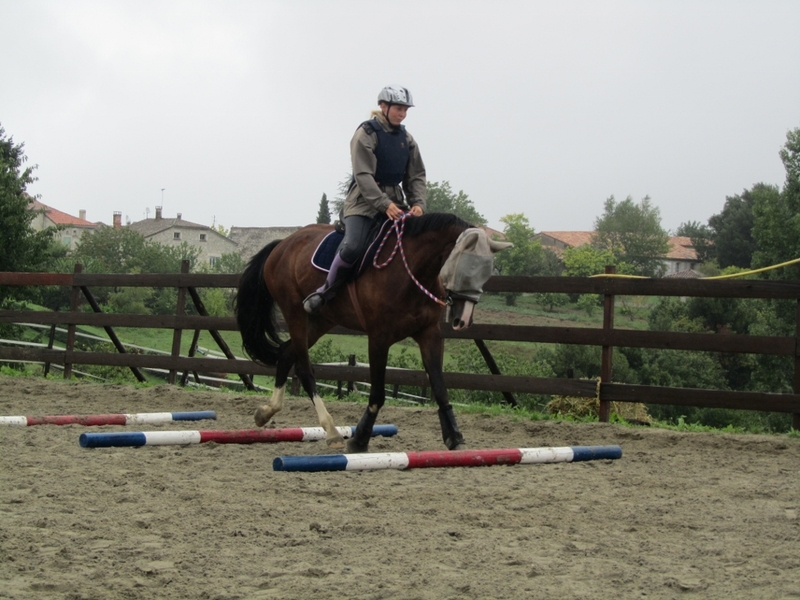 A gentle giant, with wonderful paces and a natural aptitude for jumping. 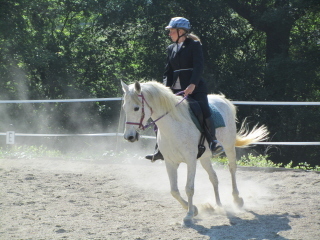 Upsala, who had been saved from the meat lorry by a charity, was a real pleasure to start. Incedibly she loved people and was very trusting. Lady had recently been imported from Ireland. 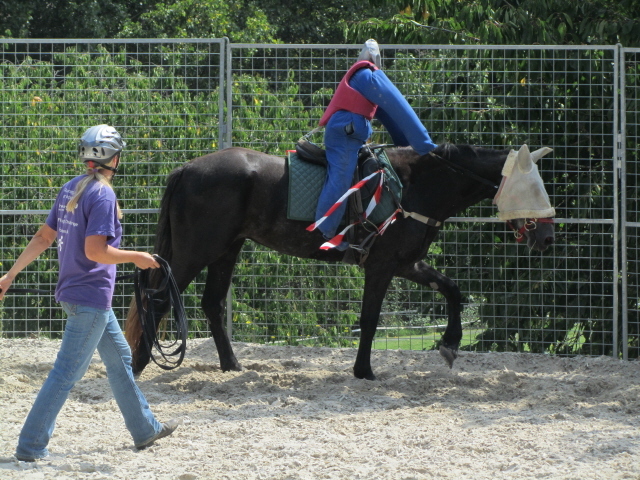 She was a trickier starter as she didn't like the movement of the rider's legs, so we used the dummy to desensitise her. Scarlet, also recently arrived from Ireland, was an interesting re-starter as her solution to dealing with stress was to lie down. Juno came for 2 weeks pre-starting. She was a quick learner but would always have a very dramatic reaction to her first time with everything. 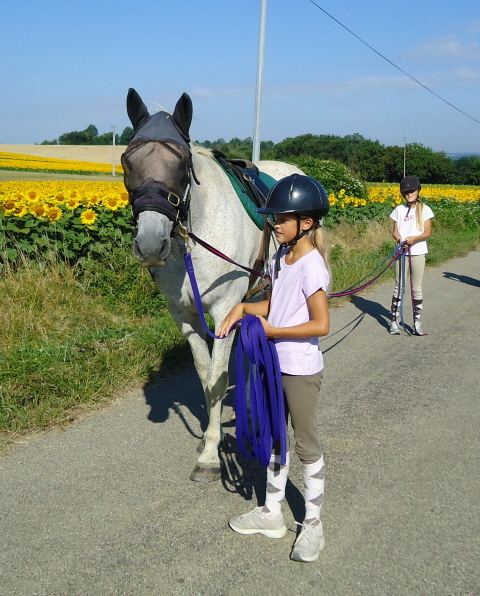 We had the lovely Bambi, Upekkha, Victoire, Dusty and Unique. 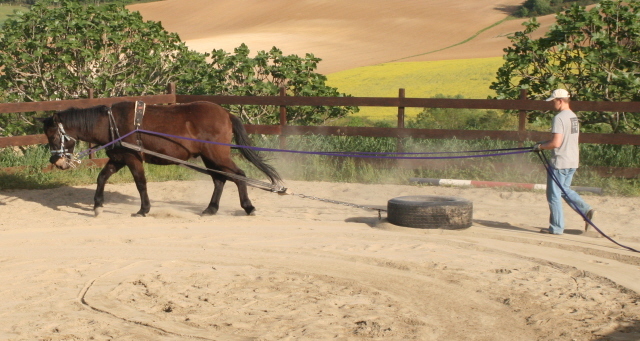 Had panicked several times pulling tyres in the past (and had several accidents) and so had become terrified of anything behing him. 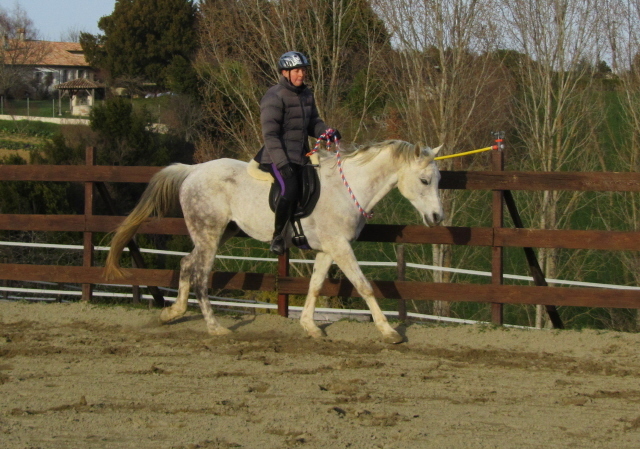 A mare that hated the feeling of the rider's legs and was very difficult to hack out. Learning to be brave out and about. 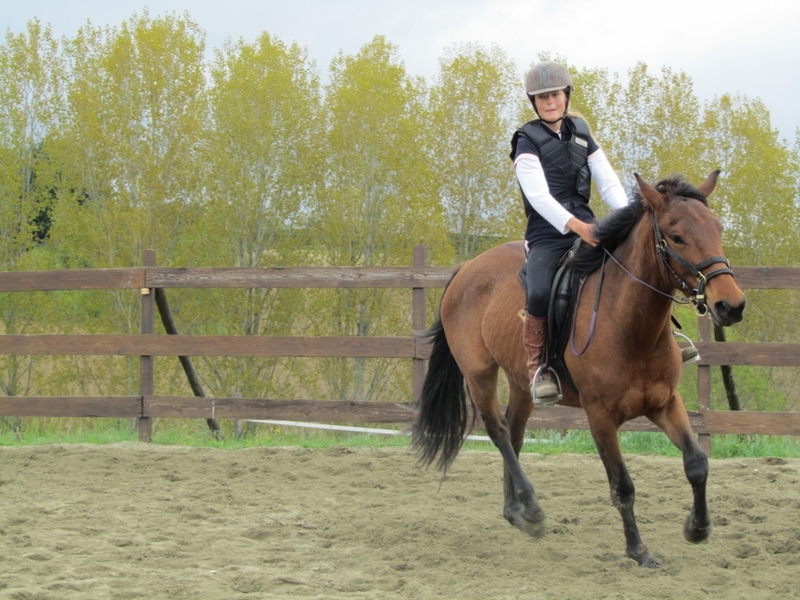 A hormone supplement helped her accept her rider better. A very bad loader. 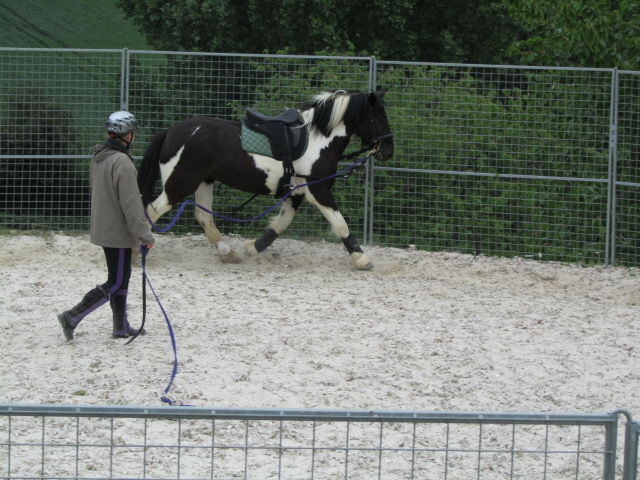 We made enormous progress in our first session and her owner followed up the work in multiple locations to create a very easy loader. 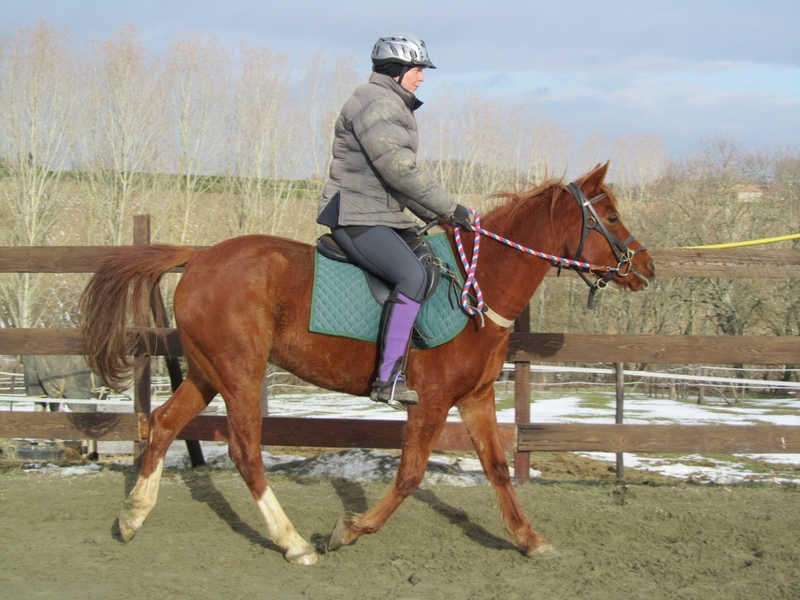 A delightfully sensitive and energetic Welsh cob who was here for in-hand and ridden schooling, with a particular focus on lateral work and flexion. 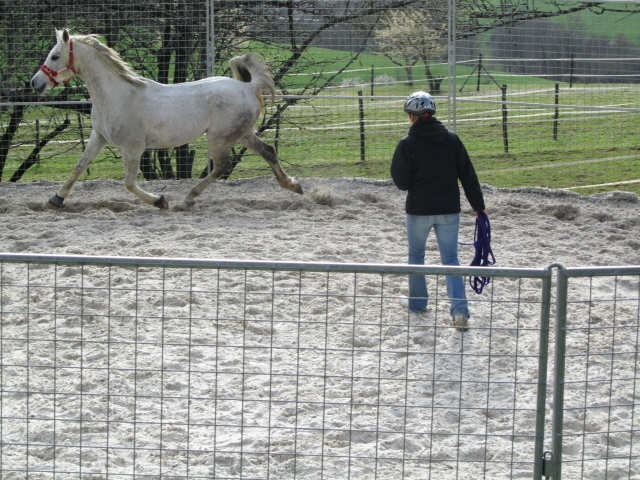 We included an introduction to jumping which she loved. 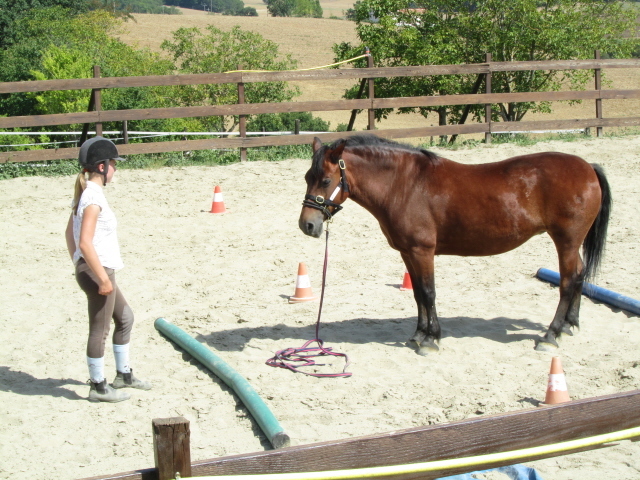 A very gentle, sweet pony who had been abused and as such was impossible to catch or to touch. 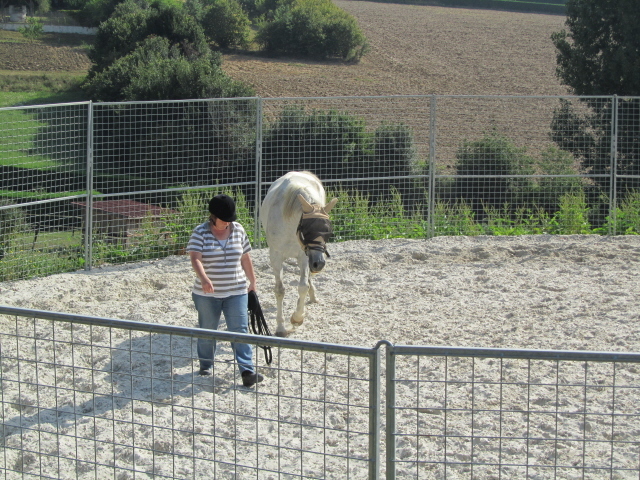 The photo is at the end of her stay with a young girl who was visiting the yard for the first time. 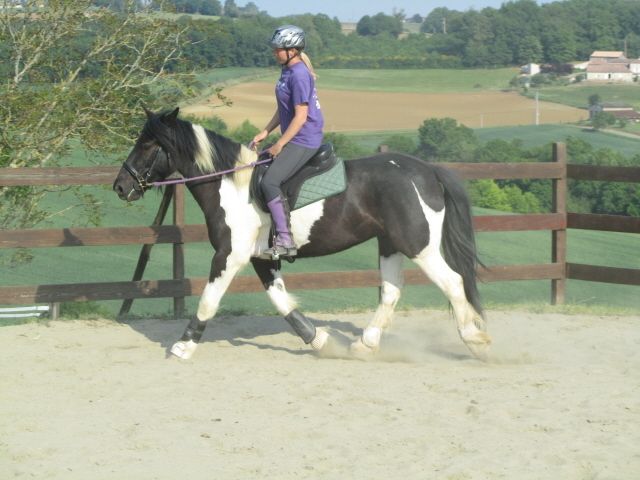 A young sensitive Irish cob who had become over-excitable and therefore difficult to handle. 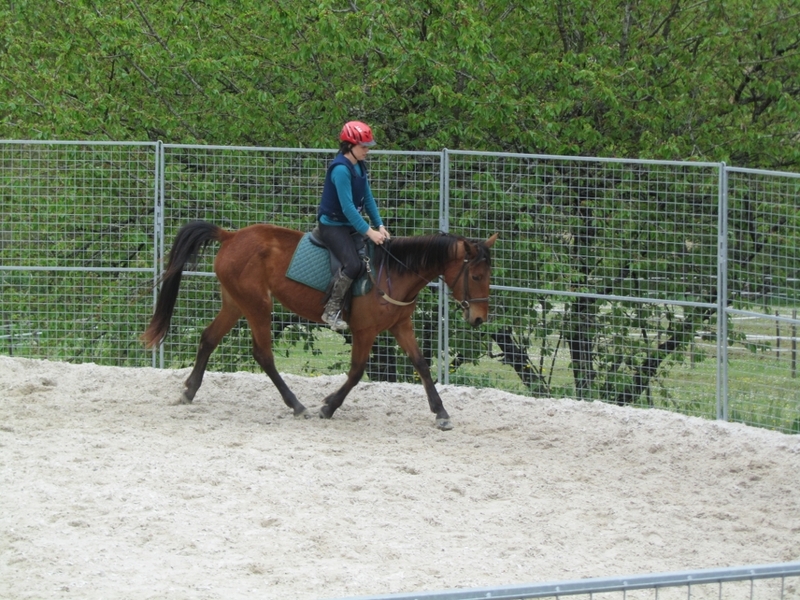 She came for a period of in-hand and ridden schooling and desensitising. 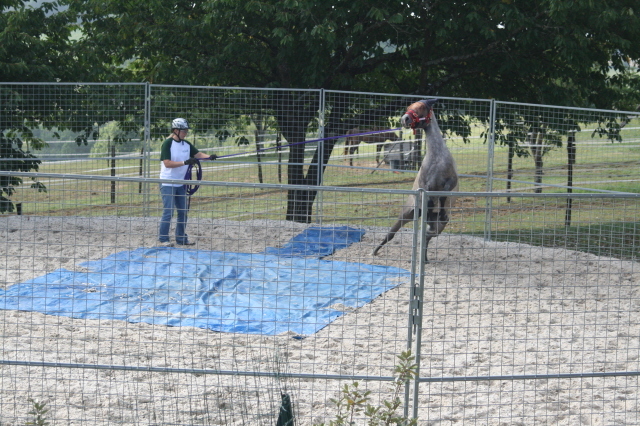 Jo worked with the owner to re-establish her confidence in Angel. 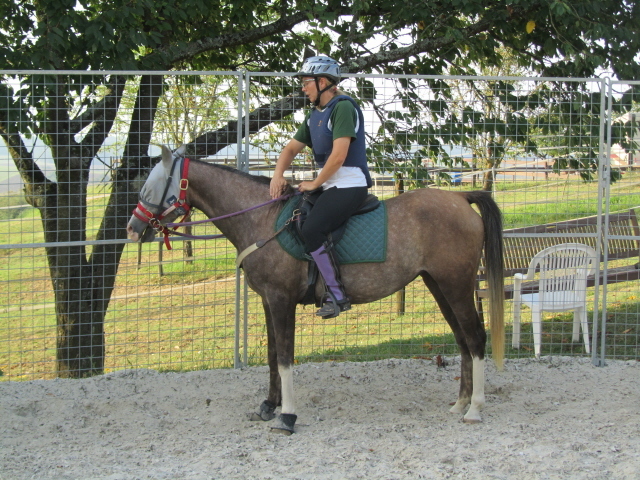 A talented endurance arab who becomes highly stressed when separated from other horses, in particular at endurance competitions. 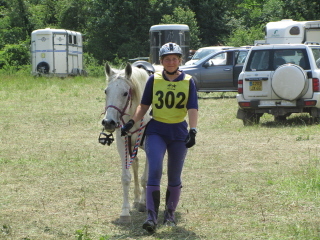 She was with Jo for the 2011 endurance season. 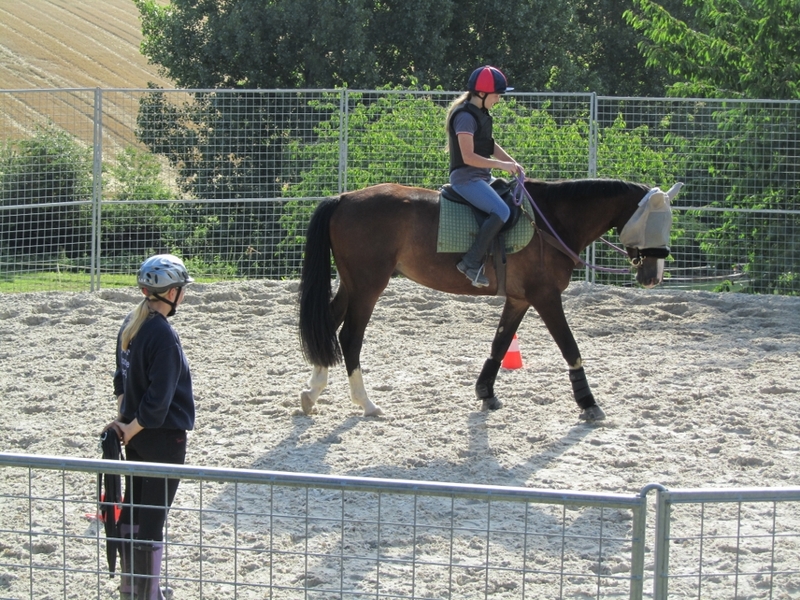 Jo focused on schooling, endurance fittening and maximising her exposure to the world, including both endurance and dressage competitions. 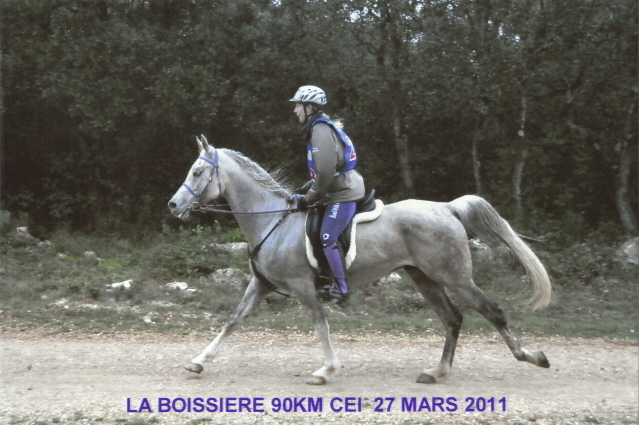 Jo qualified Kalinka all the way to her first International qualification, CEI * 90kms at Monpazier in September. 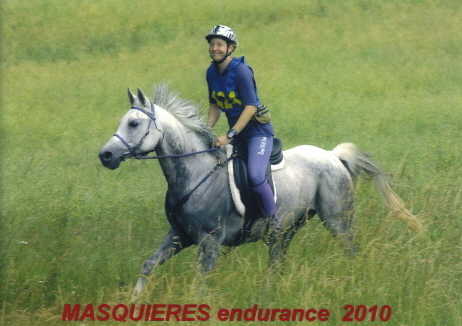 Kalinka has now gone to a member of the Belgium Endurance squad to continue her competitive career. 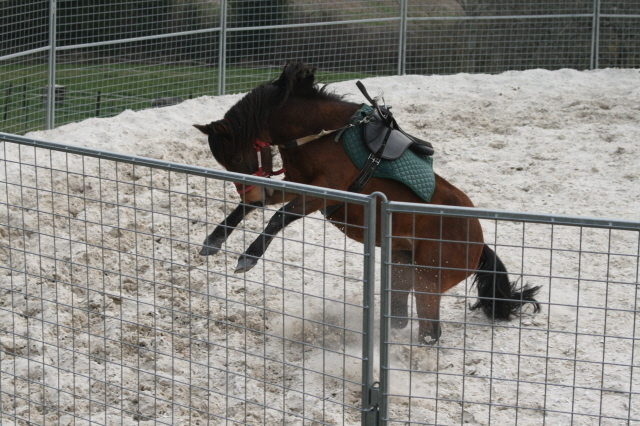 After a very bad experience with a vet following an injury to his leg Altaïr had become very difficult to handle. 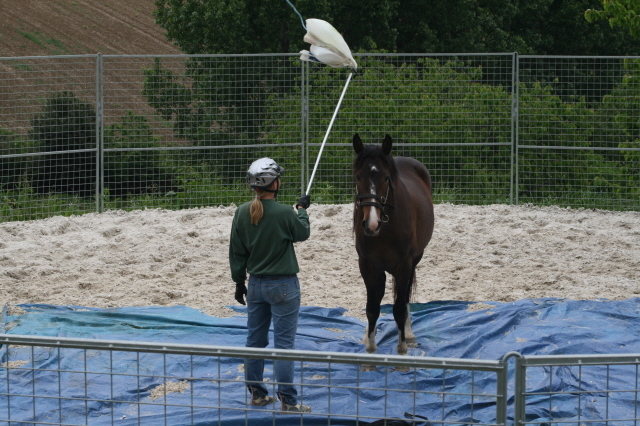 In preparation for his castration it was essential that not only he was happy to be touched everywhere but that he was happy being hosed and standing on tarpaulin.